Few games have generated the amount of hype that Gameloft’s N.O.V.A. – Near Orbit Vanguard Alliance [App Store] has, and even fewer have managed to live up to that same hype. NOVA is one of those rare instances where a upcoming game is everything we wanted and more. It’s not perfect, but there aren’t many games to even compare it to on the platform. NOVA feels like a complete video game experience, something which is quite rare indeed on the landscape of bite sized games that make up the App Store. In Nova you play as Karl Wardin, an ex-space marine who has been reactivated to investigate some strange alien activity in a futuristic setting where the Earth has depleted its resources and no longer can sustain life, forcing humanity to live on nearby orbiting colonies. Admittedly, the plot isn’t anything to write home about and the voice acting ranges from passable to downright cringe-worthy at times– Especially whenever Karl himself speaks. Thankfully, the gameplay itself more than makes up for these shortfalls. Eventually after fixing a few different parts of the ship and killing oodles of aliens, you will make your way to the bridge to initiate the self destruct sequence and escape back to your ship. You then fly down to a planet with beautifully rendered lush forests which also happens to be infested by these same (although slightly different colored) aliens. The rest of the game continues in a similar fashion, with different characters telling you where to go and what to do across 13 different levels that take place in five distinctly different environments. 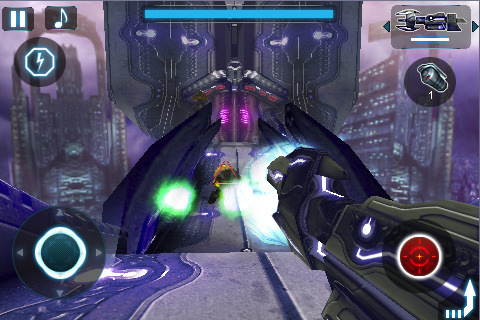 The run and gun action is broken up by mini games, a level where you man the turrent on a warthog-like truck from Halo, and even a couple boss fights. Scattered throughout the levels are locked crates which must be opened by playing a brief mini game where you move different objects around on a grid to solve a puzzle where you’re directing a laser beam from its source to the target. None of these are particularly difficult, and depending on how you feel about mini games you will either find these to be enjoyable distractions or just too annoying to bother with. Thankfully, it seems like there is enough ammo dropped by enemies and laying on the ground that the crates are optional but you will be forced to solve a few of these puzzles throughout the game as you “hack" things to progress. Similar to Halo, your life is measured by a shield meter at the top of the screen which depletes when you take damage and recharges slowly afterwards. Your shield gauge also serves as your oxygen supply when you’re in space, and your super abilities also take off a chunk of your shield’s power. Super abilities? Oh yes, straight out of Metroid Prime you will slowly gain new abilities such as the ability to freeze enemies, shoot a charged up energy beam, and even run faster with speed boots. If you’ve played Modern Combat: Sandstorm [$4.99 / Free], the controls in NOVA will be instantly familiar to you. If not, the game uses a virtual joystick on the left side of the screen for movement, and moving your thumb around the right side of the screen changes your view around. Different buttons frame the screen that do things like fire your weapon, toss a grenade, change weapons, reload, etc. There are two other included control schemes, one where the screen is split in half and moving your left thumb anywhere controls your movement while your right controls your view (essentially just removing the virtual joystick) and another with two virtual joysticks where you tap the screen to fire. I’ve found the default controls to be fine, although I did spend some time fiddling with the sensitivity. Another nice feature is the ability to move all of the elements of the game’s UI around. I’ve moved the reload button closer to the fire button because I’m a compulsive reloader in first person shooters, but you can customize it however you want. (Although currently this option only seems available by adjusting your controls mid-game, and not from the main menu.) Strangely enough, even though it seems that Gameloft has put a great deal of thought in to different control options and customizations, the ability to invert the Y-axis of the camera control is notably absent. What will leave you scratching your head even more regarding the lack of invert look is that Modern Combat: Sandstorm, a game which shares a similar engine to NOVA includes Y-axis inversion. You can however flip the screen orientation, something that should make iPod touch users happy. 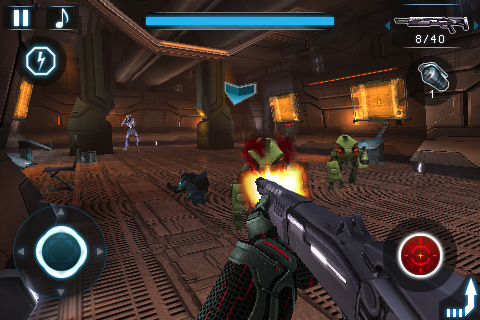 The performance of the game is phenomenal on the iPhone 3GS with fast load times, high frame rates, and everything else you could ask for in a first person shooter. Meanwhile, reader reports all the way down to the slowest device in the iPod family have been said to be smooth. Even while playing online in NOVA’s four player deathmatch mode, which surprisingly enough seems to be working just fine for everyone, a nice change of pace from Gameloft’s recently released Modern Combat: Sandstorm multiplayer update. Playing online requires both WiFi and a Gameloft Live account. Registering for Gameloft Live is easy, and once you’re online you will have the option to play deathmatch or look at the worldwide leaderboards of players with the most points and kills. When creating a deathmatch game, available options include choosing one of the five maps, as well as enabling or disabling weapon stay and aim assist. Games can be set with a time limit or a frag limit, and both can be set to none to play for as long as you’d like. When joining a game, you’re thrown in to a lobby which lists available games that have open slots for you to join. Those of you waiting for an Eliminate “killer" will be disappointed to discover that currently there doesn’t seem to be any random matchmaking, or the ability to have friends-only private matches. All you can do is create a game and hope that three of your friends join it before other people do. Despite its limitations, online multiplayer (as well as local bluetooth/WiFi multiplayer) is a lot of fun and performs surprisingly well. I haven’t come across any lag or connection issues, and so far it just works– Although the true test of NOVA multiplayer will be how well it holds up once players start getting good at the game and scrutinizing the weapon balance. It’s too early to say how large the online community will get and what kind of staying power NOVA’s online presence will have, but it seems quite enjoyable right now. If you’re a fan of first person shooters, or any of the previously mentioned console classics that NOVA is obviously inspired by, then you too will also likely really enjoy NOVA. It’s one of the most ambitious iPhone games I’ve played so far, and despite the questionable originality of the game I’ve really got to hand it to Gameloft for creating such an amazing iPhone experience.